We’d love your help. Let us know what’s wrong with this preview of Brave, Not Perfect by Reshma Saujani. Imagine if you lived without the fear of not being good enough. If you didn't care how your life looked on Instagram, or worry about what total strangers thought of you. Imagine if you could let go of the guilt, and stop In a book inspired by her popular TED talk, New York Times bestselling author Reshma Saujani empowers women and girls to embrace imperfection and bravery. The problem is that perfect girls grow up to be women who are afraid to fail. It's time to stop letting our fears drown out our dreams and narrow our world, along with our chance at happiness. To ask other readers questions about Brave, Not Perfect, please sign up. Is this book appropriate for a girl who is 10 years old and a good reader? Perfect for a TED talk and just a tad bit repetitive and go-get-it-ish for a book. Having read this book, though, I realised how lucky I am because I've never been told that I ought to be perfect (or ought to be something other than just happy and content, for that matter) or, that being a girl, I'm a less something. I grew up in the family where women would have none of this “softer gender” thing (my great-grandmother travelled across the country during the WW2 on her own with six little childre Perfect for a TED talk and just a tad bit repetitive and go-get-it-ish for a book. Having read this book, though, I realised how lucky I am because I've never been told that I ought to be perfect (or ought to be something other than just happy and content, for that matter) or, that being a girl, I'm a less something. I grew up in the family where women would have none of this “softer gender” thing (my great-grandmother travelled across the country during the WW2 on her own with six little children), and men - my Dad and my Grandpa - lauded the brilliance, kindness, generosity and, yes, bravery of the women they love. In fact, my Grandpa, one of the smartest men I know, my constant interlocutor and opponent, encouraged me not to use "but-I-am-a-girl" as an excuse to not understand or not know something. When I was at school and couldn't figure out how to deal with a difficult math homework, he tried to explain me things that I found too complicated to grasp. Refusing to make an effort, I asked him to just tell me what the answer was, "because I'm a girl", I added. "So what?" he said. In this regard Brave, Not Perfect is an eye-opening book for me as what I've been taking for granted my entire life turned out to be a privilege. And yet, I, too, don't often feel brave enough, and I'm definitely prone to either having a perfect result or not doing anything at all. I asked myself, why. And I daresay it's because things are a bit more complicated in real life than they are in a TED talk or a How-To book. Violet wells Your great grandmother, there's a story I'd love to hear! Netta Violet wrote: "Your great grandmother, there's a story I'd love to hear!" My great grandmother was an epic woman, according to what I've been told. I c Violet wrote: "Your great grandmother, there's a story I'd love to hear!" This book has something to offer women that struggle with trying to be perfect, saying no, and reaching for their goals. Unfortunately, I do think that many women fall into at least one of these categories. Many don't value themselves enough and are afraid of being judged harshly, embarrassed, or failing. Those are the women that this book attempts to reach. I thought it was a decent book for someone that is looking for some support in moving forward out of this type of life cycle. Unfortunately This book has something to offer women that struggle with trying to be perfect, saying no, and reaching for their goals. Unfortunately, I do think that many women fall into at least one of these categories. Many don't value themselves enough and are afraid of being judged harshly, embarrassed, or failing. Those are the women that this book attempts to reach. I thought it was a decent book for someone that is looking for some support in moving forward out of this type of life cycle. Unfortunately, I did not find anything new in the book. Of course, my education is in mental health, so I may be more experienced in this area than some, but I also think that a lot of this just comes with time and life experience. Therefor, I also think it may be more useful to someone that is younger. The last part of the book offers some helpful suggestions to people trying to break these habits, however some of it may be easier said than done and women should be aware that it will take not just bravery, but motivation and repetition of effort to effect the type of changes suggested. I did have one issue with the book and that is that the author involves politics on several occasions. At times I could see how it applied to what she was trying to say, but other times she just added it in because it is an interest of hers. I feel that this might alienate women that have a different political view than she does. I would suggest that there are plenty of women with opposing political views that the author might be able to help who would be turned off by the political aspect. In addition, I found the book to be a bit too repetitive for my taste and took longer to finish than it should have. I didn't think it was a bad book, but I didn't find it particularly interesting either. However, if the subject interests you, go ahead and give it a try. You may love it. Thank you to NetGalley and Crown Publishing for providing me with a free electronic copy in exchange for an honest review. An outstanding personal development/self-help/growth book about the ways men and women are cued to behave differently. Women, so frequently, are encouraged to be perfect and when something can't be done in such a way, they shouldn't bother trying. That leads, then, to not trying new things or developing their bravery muscle. Saujani offers up some of the ways that bravery can be practiced and integrated and how to break away from those preconceived ideas of perfection. Short, succinct, and doesn' An outstanding personal development/self-help/growth book about the ways men and women are cued to behave differently. Women, so frequently, are encouraged to be perfect and when something can't be done in such a way, they shouldn't bother trying. That leads, then, to not trying new things or developing their bravery muscle. Saujani offers up some of the ways that bravery can be practiced and integrated and how to break away from those preconceived ideas of perfection. Short, succinct, and doesn't feel like a book made from a TED Talk. It offers actionable steps, powerful insights, and tons of science/social science research. The voice is excellent and encouraging. It was a reminder to not shut up in instances where speaking up or out would be of tremendous value. Perfect for those who love DROP THE BALL or who are tired of cis white dudes leading the ~disruption~ in personal development. Saujani is a woman of color, and her background is tremendously necessary in this space. Reshma Saujani is the founder and CEO of Girls Who Code. I wasn’t familiar with her, her organization, or her apparently uber-popular TED talk. Saujani is an interesting woman. I respect her willingness to be honest in this book, especially about her own (pretty big) failures. And I admire anyone who can pick herself up after a major defeat and find a way to move forward and rise above. Her message is simple but powerful. Women are under an enormous amount of pressure to act and be perfect—physica Reshma Saujani is the founder and CEO of Girls Who Code. I wasn’t familiar with her, her organization, or her apparently uber-popular TED talk. "The desire to be perfect holds us back in so many ways. We don’t speak up for ourselves, as we know deep down we should, because we don’t want to be seen as pushy, bitchy, or just straight-up unlikeable. When we do speak up, many of us agonize and overthink how to express ourselves, trying to hit just the right note of assertiveness without seeming too “bossy” or aggressive. We obsessively analyze, consider, discuss, and weigh every angle before making a decision, no matter how small. And if we do, heaven forbid, make a mistake, we feel as though our world is falling apart." *** Ask for feedback. Listen and accept it. *** Allow yourself to experience rejection. *** Do the exact thing that scares you most. *** Practice a small act of bravery every single day. *** Recognize that your feelings of fear are false alarms about 99% of the time. *** Intentionally practice imperfection. Start small so you can tolerate the stress of it. *** Don’t waste time focusing on why someone doesn’t like you. Acknowledge that some people will get you and some people won’t—and allow yourself to be okay with that. Overall, I appreciate the message of Brave, Not Perfect. It’s affirming to hear someone acknowledge the weighty expectation of perfection and then show realistic, doable ways to move beyond it. There’s probably about a pamphlet’s-worth of valuable information in here, but I’m still glad I read the whole book. I will definitely be talking about this with my kids—both daughters AND sons. Big thank you to Currency and Amazon Vine for the ARC! Thank you to NetGalley, Currency, and Reshma Saujani for an ARC ebook copy to review. As always, an honest review from me. - The author’s voice/writing style: professional, authori Thank you to NetGalley, Currency, and Reshma Saujani for an ARC ebook copy to review. As always, an honest review from me. - The book was longer! I think I would've gotten a lot more out of this if I fit Saujani's definition of a perfectionist—fixed mindset, constantly worried what others think of me, a Type-A Hermione Granger. As more of a Faramir (blessed with an awesome father instead of Denethor), I didn't quite reap the full Brave, Not Perfect experience of empowerment. Which is not to say I didn't benefit from the read. Having Saujani's concepts and assertions to push my own experiences against allowed me to more closely define how m I think I would've gotten a lot more out of this if I fit Saujani's definition of a perfectionist—fixed mindset, constantly worried what others think of me, a Type-A Hermione Granger. As more of a Faramir (blessed with an awesome father instead of Denethor), I didn't quite reap the full Brave, Not Perfect experience of empowerment. Which is not to say I didn't benefit from the read. Having Saujani's concepts and assertions to push my own experiences against allowed me to more closely define how my own drive toward perfection behaves in my life. And reading what motivates her and other Hermione Granger perfectionists to push themselves toward bravery (regret, jealousy, competitiveness) offered me the opportunity to realize that my motivations will have to be something else entirely. Even looking at some of her strategies to cultivate a bravery mindset affirmed that the ways I've worked to enlarge my life since adolescence are solid, beneficial approaches. But this was definitely more a case of Learn How Different You Are than Learn How You Too Can Change Your Life! I'm an enneagram 4, so you'd think I'd be rolling in that special snowflake-ness like a cat in catnip, but...honestly...I could really use some help with the type of perfectionism I do experience. I mean, sure, maybe we should rethink how we raise our girls, but do we really think raising them like our boys is the solution? Doesn't the way we raise our boys cause problems of its own? And, yes! Claim your truth, ladies! ...But don't think that your truth gives you the right to stop hearing others' truths, too. And it's fantastic that so many women have found that bravery has led them to creating amazing non-profits and opening new chapters of success...but isn't that still focusing on the end goal instead of the process of being brave? I didn't know who Reshma was before reading this. I wasn't sure I'd like her within the first 10 pages, but I loved her honesty, passion and commitment to living her best brave life. But what I loved the most is that she was not only a strong woman, but she supported all other women. She doesn't feel the need to put others down (mainly women) to elevate herself. So I applaud that tenfold. I also liked the research she used on how different little girls are treated than little boys. This is one o I didn't know who Reshma was before reading this. I wasn't sure I'd like her within the first 10 pages, but I loved her honesty, passion and commitment to living her best brave life. But what I loved the most is that she was not only a strong woman, but she supported all other women. She doesn't feel the need to put others down (mainly women) to elevate herself. So I applaud that tenfold. I also liked the research she used on how different little girls are treated than little boys. "I'd rather be caught trying than not at all." Yes, I'm this book's demographic: A women working in tech who doubts herself constantly. Self-help business books are hit or miss. But after reading Brave, Not Perfect I'm now realizing why they're hit or miss: Ask yourself, "Am I this book's demographic?" If the answer is no, then the book will be a miss. Just because you're working in the corporate world, doesn't mean every pseudo-psychology/business book is meant for you. Some are written specially "I'd rather be caught trying than not at all." Self-help business books are hit or miss. But after reading Brave, Not Perfect I'm now realizing why they're hit or miss: Ask yourself, "Am I this book's demographic?" If the answer is no, then the book will be a miss. Just because you're working in the corporate world, doesn't mean every pseudo-psychology/business book is meant for you. Some are written specially for C-suite or VPs who have the flexibility to make large scale choices. But Brave, Not Perfect was written for me. 1) You spend too much time reading, rewriting, and rereading an email before you send it because one small grammar or spelling mistake would plague you for the rest of the day. Or worse, make your colleagues think you're an idiot. 2) You didn't apply for the job you wanted because you didn't meet 100% of the requirements and don't already know how to perform it perfectly. Because taking the time to learn the job could waste your employer's time, and you'd hate to do that. 3) You sacrifice your time to please someone else, to make them like you more, even if you really don't want to do it. 4) You have a safety net in place that allows you to take chances. This book is not for the working single mom, living paycheck to paycheck just to put food on the table, who can't afford to take risks with her or her family's lives. There's a certain level of privilege this book caters to. That's not necessarily a bad thing. Multi-millionaires need financial advisers, that doesn't mean being a financial adviser is an evil profession and shouldn't exist. This book is very much needed for the sad demographic of ~20% women in tech. As I was reading this book (which took only a day because I couldn't put it down), all the women in my life that I love and want to see succeed would bubble up in my head. In one section, I thought, "This is what A needs to read!" In another section, "I need to tell B to do this!" So yeah, ya'll been warned. I'm going to tell you fine ladies to read this book. Let me just start by saying I really respect Girls Who Code. I'm not a girl anymore, I'm a woman (34), but if I had a Girls Who Code program in my school things might have gone a bit differently for me. Reshma illuminates a lot of problems girls face and have faced in our society growing up. The information and anecdotal evidence wasn't new to me, it was everything I've heard before and then some, before I've lived through the circumstances she admonishes throughout Brave, Not Pe More like a 3.5. Let me just start by saying I really respect Girls Who Code. I'm not a girl anymore, I'm a woman (34), but if I had a Girls Who Code program in my school things might have gone a bit differently for me. Reshma illuminates a lot of problems girls face and have faced in our society growing up. The information and anecdotal evidence wasn't new to me, it was everything I've heard before and then some, before I've lived through the circumstances she admonishes throughout Brave, Not Perfect. I have well-meaning parents, but I sometimes wonder what would have happened in my life had they not cringed every time I was interested in something that involved math. "That has math in it, you can't do that." I was interested in science once upon a time, but...because it had math in it, something I didn't do well in, I was discouraged from even trying. When I picked up an astronomy class in university my parents scoffed at me because they just ~knew~ I would fail and end up dropping out. So, when I DID end up dropping out I felt like I was just proving them correctly that I was a screw-up and couldn't learn math or do anything involving math. I'm actually feeling angry as I type this review. Teachers have told me that they were frustrated with me because I wasn't getting it, or learning the math and ugh. Just ugh. Everyone around me actively discouraged me as a child from really going after my dreams and it's not just me this happens to. It happens to countless girls in school. So, if you have a young daughter, reading this book might be a good idea. If you're already a fan of Reshma's, then none of this information is going to be new to you. All in all I thought this was a pretty okay read, though I don't think I was truly the demographic. I'd say this book is way more helpful if you're a young woman just starting out in the world or the parent of a young woman. Sadly, I feel like the advice is lost on me only because I've already learned the lessons within the book and I feel like I could tell other young women the same stuff Reshma espoused. I'm not often a fan of this genre of book. However, I feel that this is the perfect time for this book to come out. It adds to the impact of many of the female-oriented movements that are taking place right now and expands on some of the less seen and often misunderstood aspects of being female. Well written and easy to understand I believe this book is a great read for any woman, girl, or person who has either in their life. It is great for us to understand that while every female does not feel I'm not often a fan of this genre of book. However, I feel that this is the perfect time for this book to come out. It adds to the impact of many of the female-oriented movements that are taking place right now and expands on some of the less seen and often misunderstood aspects of being female. Well written and easy to understand I believe this book is a great read for any woman, girl, or person who has either in their life. It is great for us to understand that while every female does not feel the pressure to be perfect there is at least one scenario in this book that I think everyone can relate to- regardless of their gender. I recommend this book to most everyone. I really loved this book and the author's story. As a former competitive gymnast who sole purpose for 15 years was to chase perfection, letting go of that has been difficult as an adult. I found Reshma's story refreshing and inspiring and thought the tips in the back were quite helpful. My favorite part of this book was the way she approached it and the variety of examples and stories she used. This is a book for everyone - business women, moms, students etc. "Where along the way did we trade in our confidence and courage for approval and acceptance? And why?" The girls are taught from a young age to be nice, pretty, be a young lady who is soft and perfect. You're not allowed to speak out against injustice, you're not allowed to tell your truths, you're not allowed to be aggressive and fight for what you believe in. "Fighting with the world" is how I was always labeled because as a young girl with three brothers I had to 'fight' for everything including "Where along the way did we trade in our confidence and courage for approval and acceptance? And why?" "Fighting with the world" is how I was always labeled because as a young girl with three brothers I had to 'fight' for everything including attention. Nothing was handed to me and hell I certainly was not spoiled contrary to the beliefs being an only girls with three boys. In fact I was also labeled 'the mouth of the south' by my non loving parents who ruled with an iron hand and taught with militaristic style. I wouldn't just allow someone else to have more rights than me and when something was wrong I sure as hell called it out. I still do and it's why I'm both and empath and a feminist. I don't believe women should be forced to take a back seat to societies norms. Being perfect is not brave; failing and succeeding now that's bravery! Perfection is great if you want to be an overblown hyped up model who is on a starvation diet -- I'd know-- Never tall enough, skinny enough, quite smiling all over self enough.. But today I know I AM ENOUGH! We are all made in the image and likeness of GOD. We all have something special we are born with to offer up to the world. We can all do our part to help others and in helping others using gratitude and kindness we can keep the ball rolling. It's not our job to be exhausted, to give so much we lose ourselves, to work to death with nothing to show but a measly $7.25 an hr salary. It's our job to help one another. To be the light that supports and ignites the spark. As a points of light recipient our president mocked the light but I'm so proud to be able to help my fellow members of my community. What will be our legacy? What will be your dash? Disclaimer: The publisher has given me an E-ARC of the book via Netgalley in exchange for an honest review. Brave, Not Perfect: Fear Less, Fail More, Live Bolder is a book every person needs in their life. Especially girls and women. The book discusses how you'll never be able to do a thing without being courageous. It's about taking chances, failing, and learning from those failures. Reshma Saujani really did an impressive job in being an inspiration. Even myself, a guy, learned so much from a Disclaimer: The publisher has given me an E-ARC of the book via Netgalley in exchange for an honest review. Reshma Saujani really did an impressive job in being an inspiration. Even myself, a guy, learned so much from a book that is marketed to empower women. I learn so much about the inequality of life even for our modern age. I felt the poignant reality of women being raised to be perfect and not brave. And most importantly, I saw that anything is possible if only we put our minds to it and find the right support. did find myself exclaiming "Exactly!" or "OMG this is so me!" quite a few times as I was reading the book. It does a great job of pointing out the many small (and big) ways in which we women tend to beat ourselves up over insignificant things and also gives some good pointers for "building the bravery muscles". Saujani ran for Congress and lost. It was the first major failure of her life. And after she picked herself up, mourned and recovery she realized that it was a gift, an opportunity to change directions and a moment that not many women allow themselves to face. She started Girls Who Code and she wants to make resilience and bravery a foundation of girls lives. Why I started this book: I am always looking for books and reminders to be BRAVE. Why I finished it: Short and sweet, this is a great remind Saujani ran for Congress and lost. It was the first major failure of her life. And after she picked herself up, mourned and recovery she realized that it was a gift, an opportunity to change directions and a moment that not many women allow themselves to face. She started Girls Who Code and she wants to make resilience and bravery a foundation of girls lives. Beginning has some interesting research into gendered upbringing, and the end has some interesting ideas about how to make bravery a daily practice. The middle gets lost in selling bravery as a concept and even takes some irrelevant (although accurate) shots at the current government. I liked it, but it could have been half as long. This book called me out in a lot of ways and I will be thinking on it for a while. I did have a quibble with one part where it felt pretty victim blaming when talking about the Aziz Ansari Me Too thing. I get what she was trying to say but it didn’t come off quite right. Though honestly I’m not sure how to have it come off better. I wouldn’t let this put you off of reading it though. I think Saujani has a very compelling message and mission and I highly respect what she’s doing for girls and our culture. This book just seems to be written for someone who has never thought about being brave or being their own person before and it doesn’t offer a lot of depth. I’d recommend this more to younger teenage girls. There are a lot of great takeaways from this book. The main one, something I can't get enough reminders for, is to doubt yourself less. It was a comfortable read that backs up anecdotes with research. Although I could have done without some of the celebrity name dropping, it doesn't detract from the message. A must read for anyone interested in culture and gender studies! Highly recommend. I have watched Reshma Saujani's TED talk and I feel this book is an extension of the talk. Both are such an inspiration for women who feel stuck in the loop of disappointments and tries to get everything done perfectly. I feel it is a little bit too long and I was puzzled about some examples that Reshma Saujani mentioned in the book. Overall it’s a good book and the author’s credentials add value to every word in it. Girls are raised to be perfect and boys are raised to be brave. 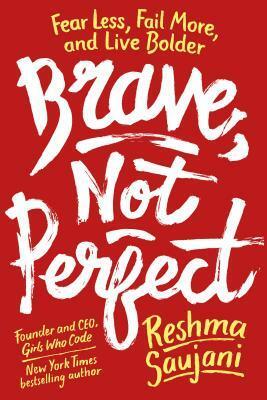 Brave, Not Perfect is exactly what it appears to be - an extension of Reshma Saujani's motivational TED Talk. The message she sends in both the talk and the book is clear, and it's a message that sends chills up your spine when you realize how true it is. She states, "Most girls are taught to avoid risk and failure. We’re taught to smile pretty, play it safe, get all A’s. Boys, on the other hand, are taught to play rough, swing high Girls are raised to be perfect and boys are raised to be brave. 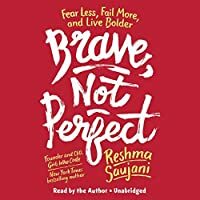 Brave, Not Perfect is exactly what it appears to be - an extension of Reshma Saujani's motivational TED Talk. The message she sends in both the talk and the book is clear, and it's a message that sends chills up your spine when you realize how true it is. She states, "Most girls are taught to avoid risk and failure. We’re taught to smile pretty, play it safe, get all A’s. Boys, on the other hand, are taught to play rough, swing high, crawl to the top of the monkey bars and then just jump off headfirst." Crawling to the top of the monkey bars is (perhaps) less of a goal now as an adult, but avoiding risk and failure and aiming to be perfect are things that are still very much apparent in everyday life. As a more concrete example in the adult world, men apply for a job when they meet only 60% of the qualifications, but women apply only if they meet 100% of them. It's a statistics you may have heard before (originating from a Hewlett Packard internal report), and it is but one example of behaviour I see again and again as a mentor, woman, and member of the community, particularly in technology. Reshma mentions these examples as well as many others in her new book. She tells the stories of real women with real triumphs and failures. In other words: you are not alone. You are not the only one weighed down by the so-called limitations and expectations as a woman. Brave, Not Perfect drives home the point that it's not just the onus of women as individuals or even as a community to take more risks and strive to be better, but that there's a whole cultural mind shift that need to take place in order to make a real difference. All this being said, I found Brave, Not Perfect to be an easy and engaging read, whether you decide to read it front to back or (as I'm doing now) flip through it for particular sections or passages. It has an inspiring message backed by real world women and examples. The book also goes into detail with suggestions on how to become more brave in ways that are customizable and attainable; even smaller steps may be taken, as long as they bring you in the direction that you want to go. What a fantastic book! 4.5 stars. Reshma Saujani's TED talk was recommended to me by several colleagues at work, so when I saw the book, I knew a little about its premise. I have two boys, and yet, I am a girl :) So it was quite interesting reading this book with both my mom filter on and as a woman myself. I've already recommended it to all the parents I know, because so much of this book is about highlighting behavior that exists in a way that feels indoctrinated. Things we don't do consciously What a fantastic book! 4.5 stars. Reshma Saujani's TED talk was recommended to me by several colleagues at work, so when I saw the book, I knew a little about its premise. I have two boys, and yet, I am a girl :) So it was quite interesting reading this book with both my mom filter on and as a woman myself. I've already recommended it to all the parents I know, because so much of this book is about highlighting behavior that exists in a way that feels indoctrinated. Things we don't do consciously maybe because we've done them this way such a long time. It's highlighting the invisible hidden in plain sight. And like most truths, once you see it, you can't unsee it. A few years ago, I picked "brave" as my word of the year so that I could become braver. And one of the biggest shifts that happened that year wasn't that I became brave but that I realized how brave I already was. The author talks about the positive cycle of how bravery begets bravery and that is very much the case. So does realizing how brave you are because it shifts the way you see yourself and now you're no longer "afraid" to be brave. It is imperative that we turn this cycle around for our girls. The subtle (and not so subtle) push towards perfection is one of the most damaging signals women receive (and then internalize.) I still see this people-pleasing, "looking perfect on the outside but falling apart on the inside" every single day. Not only does it curb our potential as women, it also keeps us disconnected from each other because it's not possible to have real connection/belonging without authenticity. I've highlighted so much of this book and I will continue to recommend it to every parent (and woman) I know. We can only do better when we know better and this book is a solid step forward in that direction. And it also has tangible, specific next steps you can take to move into the practice of bravery. as girls, We want to be perfect before we even try. So far banyak dijelaskan kenapa rerata kita ciwi ciwi banyak yang berguguran sbg technician padahal pas di kelas sekolah dulu jauh le as girls, We want to be perfect before we even try. ini bahasannya gak seksis sih menurut w, dan tida terlalu feminis wkwk (I know ini arahnya kesana sebenernya, but ini gak begitu feminis garis keras, instead lebih ke girl empowerment, dan kusukak). Banyak banget yg bisa diambil pelajaran, diantaranya we need to braver, fail more, fear less. Kenapa kita ciwi2 suka takut gagal ? karena kita menganggap sebelum mencoba harus udah perfect dulu, nah pas udah gede, kita tuh ga selalu berhadapan sama yang gampang ditaklukan, alias kegagalan adalah sesuatu yang pasti dialami, kalo ga pernah gagal sebelumnya terus baru gagal pas dewasa, nah itu yg jadi concern, padahal mah gagal teh ya biasa aja gitu, ya tinggal bangun lagi, coba lagi (ngomong ma gampang ew). Bravery in today’s world is far more than just physical prowess, and we see hundreds of examples all around us of girls and women being brave as hell in myriad ways. Bravery takes so many different forms, and they’re all important and valuable. All bravery matters because bravery feeds on itself. We build our bravery muscles one act at a time, big or small. This is what I mean when I say it’s time for us to redefine bravery, on our terms. I received a free copy of this book. I decided to review it because I like the book, but I also think there's a lot of value in it. I’m not a scientist, however I received a free copy of this book. I decided to review it because I like the book, but I also think there's a lot of value in it. I think this price is very, very steep. The book isn’t terribly long. Saujani did a TED Talk on this subject, which I watched. There is a lot more information in the book. If this is something you’re really passionate about, then by all means, buy the book (other formats may be cheaper). But, even if you’re not passionate about this issue, perhaps even skeptical, you should read this!! Borrow it from the library and see what it’s all about. Not familiar with her TED Talk but thought it would be a good read and maybe a good message to hear again, even if it's not new or unfamiliar. Sometimes you see those oh so perfect pictures on Instagram or other social media or when you catch up with an old high school classmate and you see it seems they've got everything while you're struggling to stay afloat. You've got to be perfect, right? You have to act a certain way, you need to speak a certain way, dress a certain way, etc. Nah. Instead, Not familiar with her TED Talk but thought it would be a good read and maybe a good message to hear again, even if it's not new or unfamiliar. Sometimes you see those oh so perfect pictures on Instagram or other social media or when you catch up with an old high school classmate and you see it seems they've got everything while you're struggling to stay afloat. You've got to be perfect, right? You have to act a certain way, you need to speak a certain way, dress a certain way, etc. Nah. Instead, author Saujani encourages us to be brave. To fail. To take risks and forget about being perfect. Yes, it can be hard to break out of that mentality if you've been raised in it and it can be scary. But there are things one can do and steps you can take to change that. I thought it would be an uplifting nice read and while it is, I also wasn't exactly thrilled with it either. There's a trend to turn TED Talks into books when it should really be presented in another format (another video, blog, etc.) and wasn't really feeling this one, either. I suppose it was too familiar and too similar of a message that doesn't fit me or my needs right now. However, it could very easily be a great gift for someone who is graduating out of college or maybe someone who has been going through a tough time and realizes that "Hey, I need to be brave instead of perfect." I'm also not entirely sure if "brave" is the right word here but this is simply a matter of personal preference. I do think that this is certainly the right book for certain audiences and I would have liked something like this right out of college or around there. Reshma’s TED talk, “Teach girls, bravery not perfection,” has more than three million views and has sparked a national conversation about how we’re raising our girls. She is the author of two books, Girls Who Code: Learn to Code and Change the World, the first in a 13-book series about girls and coding which debuted as a New York Times bestseller, and Women Who Don’t Wait In Line, in which she advocates for a new model of female leadership focused on embracing risk and failure, promoting mentorship and sponsorship, and boldly charting your own course — personally and professionally. Reshma is a graduate of the University of Illinois, Harvard’s Kennedy School of Government, and Yale Law School. She’s been named one of Fortune’s World’s Greatest Leaders, Fortune’s 40 Under 40, a WSJ Magazine Innovator of the Year, one of the 50 Most Powerful Women in New York by the New York Daily News, CNBC’s Next List, Forbes’s Most Powerful Women Changing the World, Fast Company’s 100 Most Creative People, Crain’s New York 40 Under 40, Ad Age’s Creativity 50, Business Insider’s 50 Women Who Are Changing the World, City & State’s Rising Stars, and an AOL / PBS Next MAKER. Saujani serves on the Board of Overseers for the International Rescue Committee, which provides aid to refugees and those impacted by humanitarian crises, and She Should Run, which seeks to increase the number of women in public leadership. Reshma lives in New York City with her husband, Nihal, their son, Shaan, and their bulldog, Stanley.